Ernest's Street Art in Ipoh!! Grabbing latest news first thing in the morning has been a habit of many people. To the elder generation, newspaper is truly one of the best medias to access newest story around the world. Reading newspaper while having breakfast is a very common scene in most coffee shops. Nonetheless, there are people who really hunger for the news would start reading the paper on the spot. Perhaps knowing what’s happening at surrounding is a best strategy to start a day. 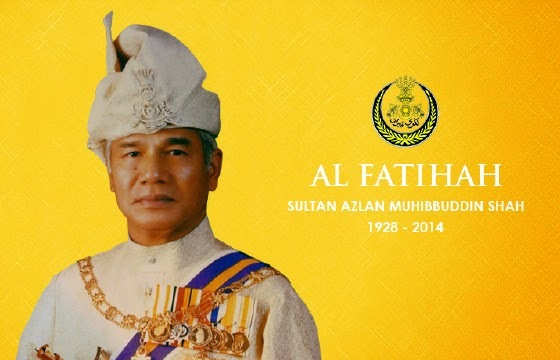 The Sultan of Perak, Sultan Azlan Muhibbuddin Shah, passed away 1:30pm this afternoon at National Heart Institute, Kuala Lumpur. 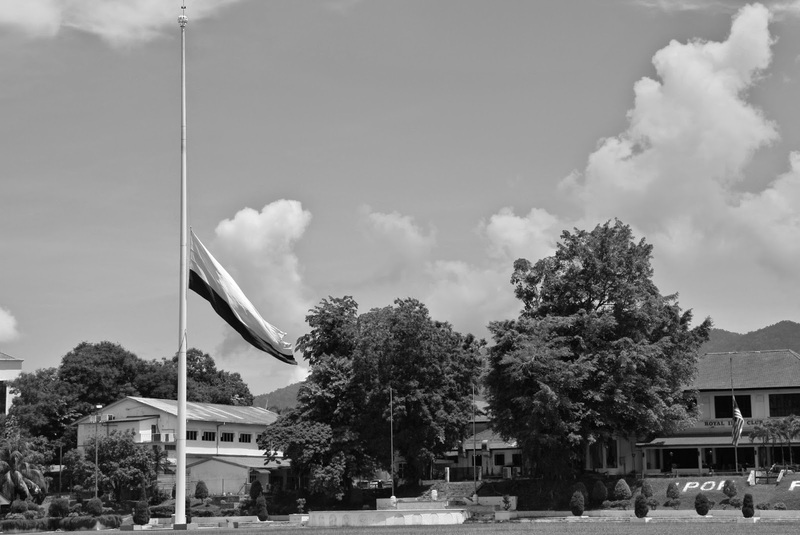 This sad news was announced by the State Chief Minister through television broadcasting in the afternoon. Apparently today is the saddest day of all Perak people. Before Sultan Azlan Shah ascend the throne as 34th Sultan of Perak in 1984, he was very active and successful in the country's legal segment. He was appointed Chief Justice of High Court of Malaya, and later became Lord President of Federal Court in 1982, which is the highest judicial post in Malaysia. There are buildings, roads & schools named after Sultan Azlan Shah/ Among them most people would be very familiar with one of the longest road in Ipoh, Jalan Sultan Azlan Shah which consists of three previous trunk roads (Tasek Road, Tiger Lane & President Kennedy Road), the Sultan Azlan Shah Airport and Sultan Azlan Shah Hockey Stadium. I was wondering about the crowd behind Patisserie Boutique Café (or should be next to the entrance of Plan b restaurant), which has been seen for several days. To my surprise, this is a flea market that I never expect to have it in Ipoh, which used to be ridiculed as cultural desert. Usually such flea market is found in Kuala Lumpur, Georgetown & Malacca. I am so excited with the simple but attractive setup . And many other gadgets that make almost every glance a surprise to me. I love this place & I also love the items displayed or sold here. Hopefully this will be a long term or permanent market that would certainly offer our guests of the city an unforgettable trip. Never in Ipoh history there are this many high rise building project running at the same time. I was once quite sceptical about the project of Ipoh Convention Centre (ICC) will turn true because it had been mentioned for years before its groundwork carried out last year. Anyway, this tower crane, which installed yesterday enhances my confidence level that there will be another landmark born in Ipoh. And it's probably a booster to the Greentown commercial pulse which has been weakened in the past five years. I have not been visiting these "tallest three" of Ipoh for some time. During my last trip here it was still under construction. However, the appearance of completed The Haven somehow quite disappointing to me. It doesn't look as classy as I imagine, though the interior may be much more better. Anyway, it will hold the crown as tallest building in Ipoh as long as there is no other high rise above 26 storeys being constructed. Even the undergoing projects, such as The Majestic, The Octagon & D'Festivo Residence cannot compete The Haven. 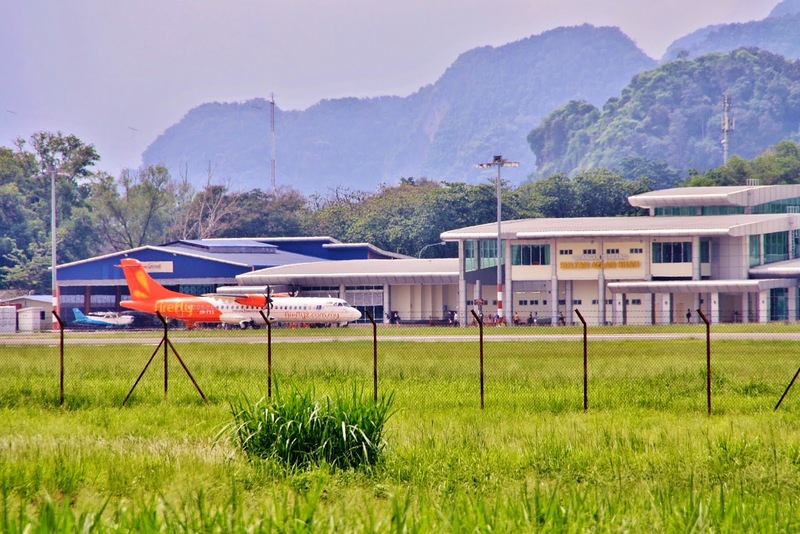 Even after extension of the runway and complete facelift of the terminal building, Ipoh airport is still a lonely airport which only one budget commercial flight operator, Firefly landing here. There was another budget airline getting ready to commence flights between Ipoh and Medan few months ago. This was followed by the runway extension which claimed to be capable of handling Boeing-737. However, the plan was last minute being called off for the reason of runway isn't fit for Boeing-737. Wasn't it surprise? No further in-depth explanation to the public, though it is not making sense at all. And the case just left silence since then. Time passes so fast. Demolition of the old building at this site of Clarke Street was like just happened not too long ago, but now the new building is almost done of its construction. Banners have been put up to look for tenant, and one of these units will be a hotel. Unlike other reconstructed buildings in Ipoh, this is an extraordinary case where the building is carrying some features which are inheriting from its predecessor. In most of the cases, when heritage building in town is demolished, its replacement usually appeared to be dissonant with its neighbours. We have been told over the years that we are progressively growing towards a developed country and the target shall be achieved in year 2020, which is less than 6 years from today. And most of us always choose to observe and to accept nice things in our living environment but pretend not seeing the poor & the unfortunate in the society. 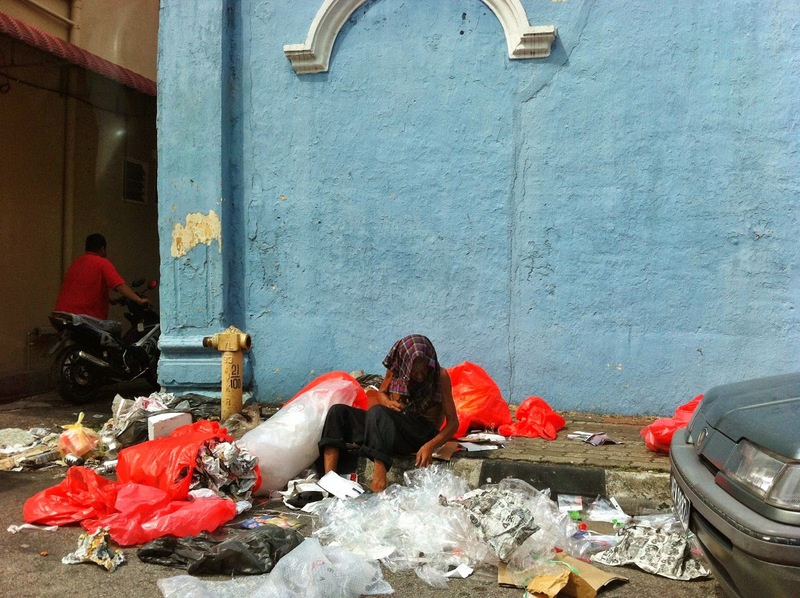 Do we realize except certain areas in the major cities, our country is indeed full of mess? There are still many people from the grass root level not able to live comfortably, but force to find some living subsidies from the waste. I am certainly losing confidence of the vision to become high income country in near future, but I just see the gap between poor and rich is gradually widening. 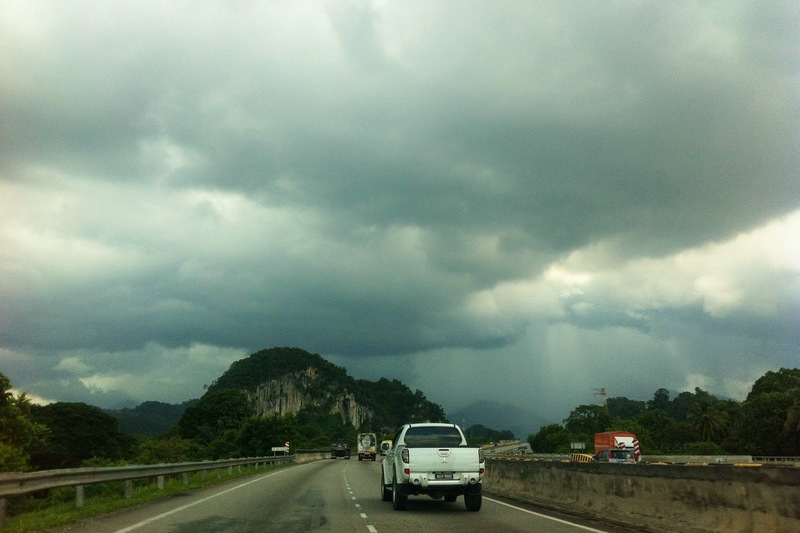 During this raining season, thunder storm in the afternoon is an everyday matter that either strikes sooner or later. Most of the times it is still a sunny day during lunch hours and the atmosphere begin to turn dark after 3pm. Anyway the routine is slightly shifted earlier today. Downpour is seen at Kledang range when I was on my way back to work after finished lunch. 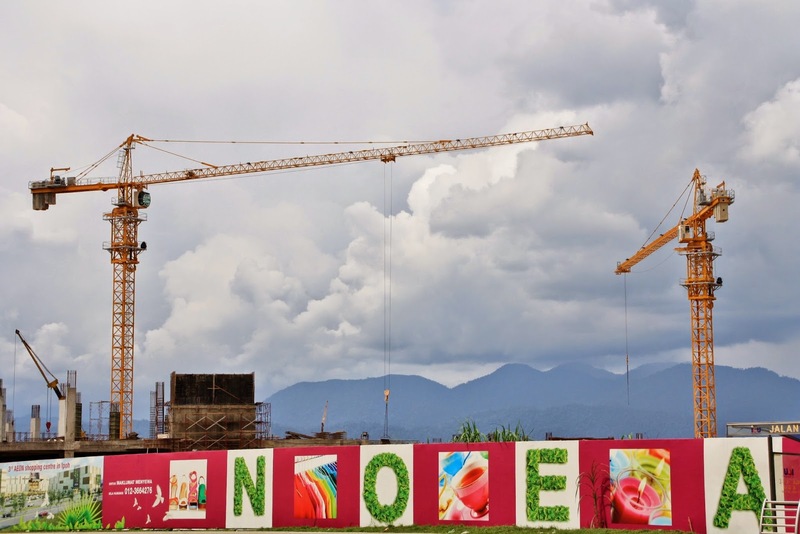 There are 2 tower cranes installed at the Aeon Klebang Shopping Mall construction site recently. I believe the progress will be at faster pace with the aid of these heavy machineries. We are seeing more tower cranes appear in Ipoh nowadays, which mean there are greater scale buildings taking shape in the city. In the past, there were only high rise buildings would utilize tower crane and never a 4-storey shopping mall, even Aeon Station 18 which was constructed in 2012. By counting these two in, there are now 8 of such cranes in the city working on new landmarks. 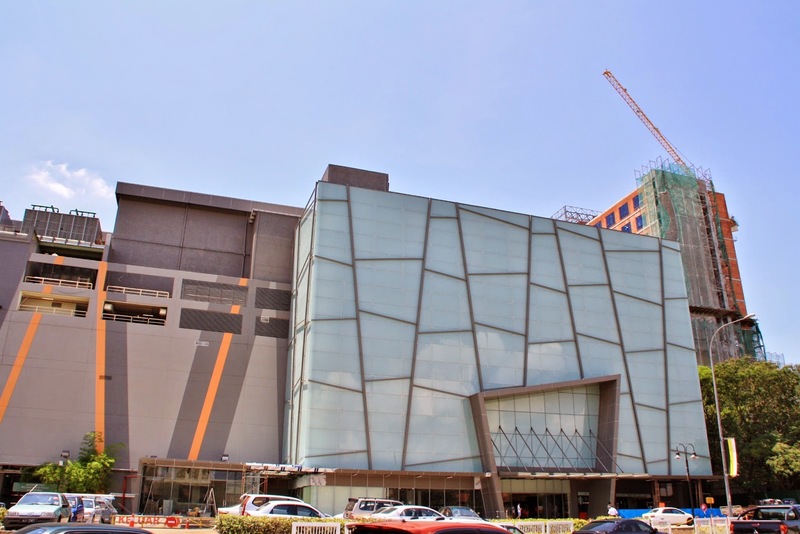 After months of intensive renovation work, Ipoh Parade's brand new look finally revealed. 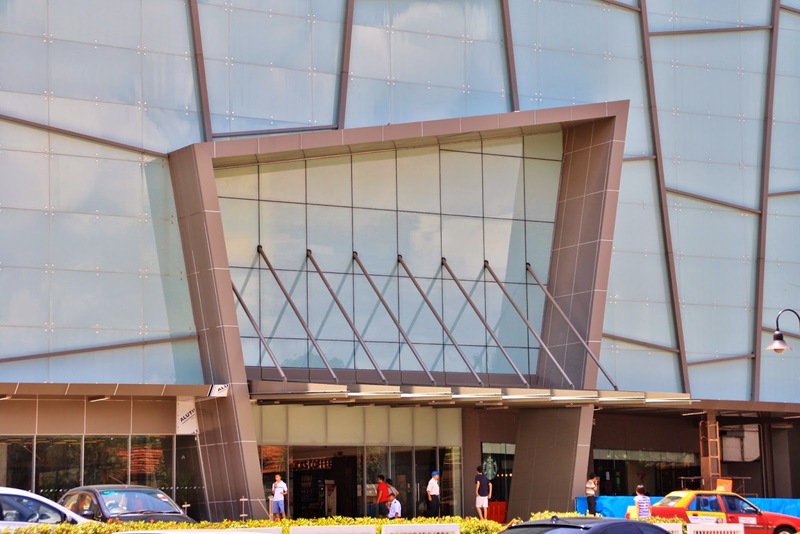 The modern architecture is first of its kind in Ipoh which make the citizen proud of it. 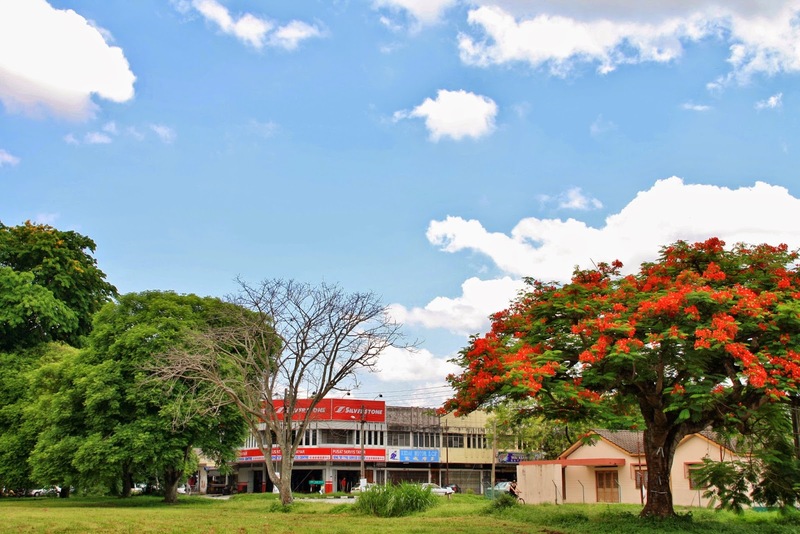 Unfortunately, giant trees that was lining up in front of the mall for more than ten years have been chopped down in order to show the artistic front entrance to public. The renovation has yet to finish as there are still minor works carried out. 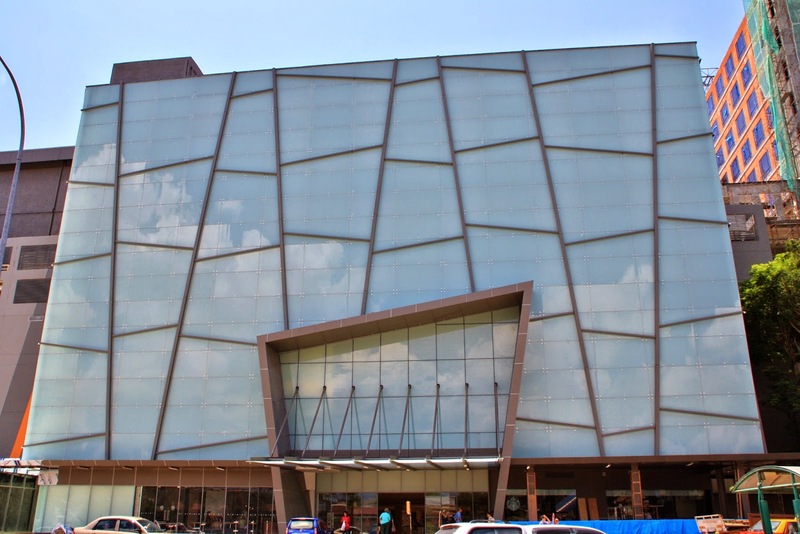 According to the original design, there should be colourful illumination from the glass wall upon completion. Sometimes the most beautiful scene can be just the ordinary one in our life, especially the one that contains our unforgettable childhood memory. When images of the past in mind combine with the real world, that would be something really touching. 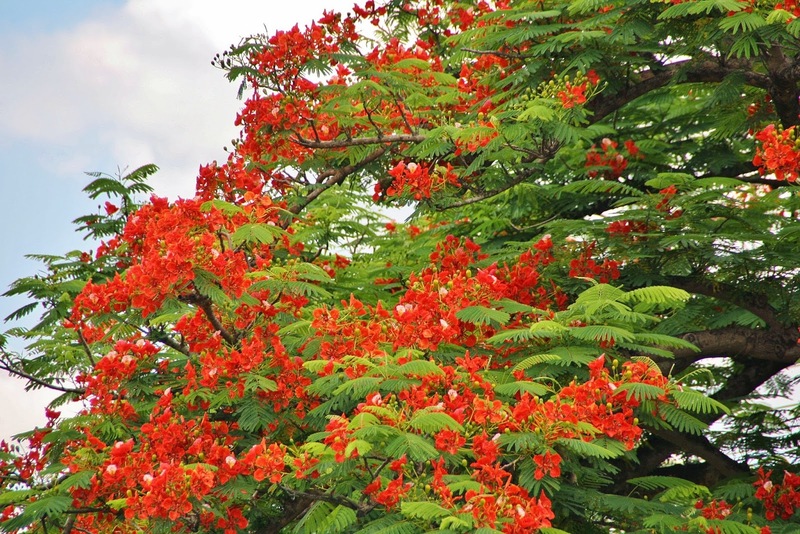 I did not pay much attention on the blooming red flowers on tree over the past decades and I can't tell its name, but it is indeed quite attractive especially in the sunny afternoon. 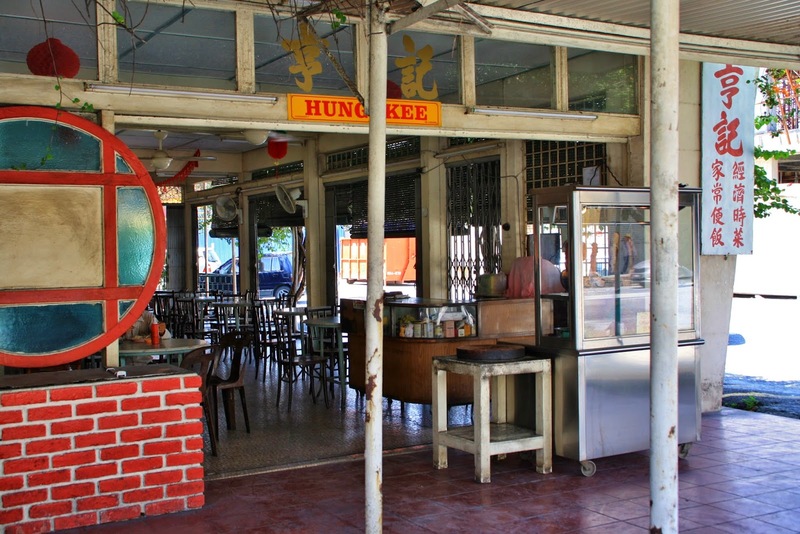 Hung Kee Restaurant, an old restaurant at the junction of Cowan Street and Clare Street. Or the simplest way to mention its location suppose to be, next to the previous Yau Tet Shin Bazaar, current site of The Octagon. The restaurant doesn't seem to change much. 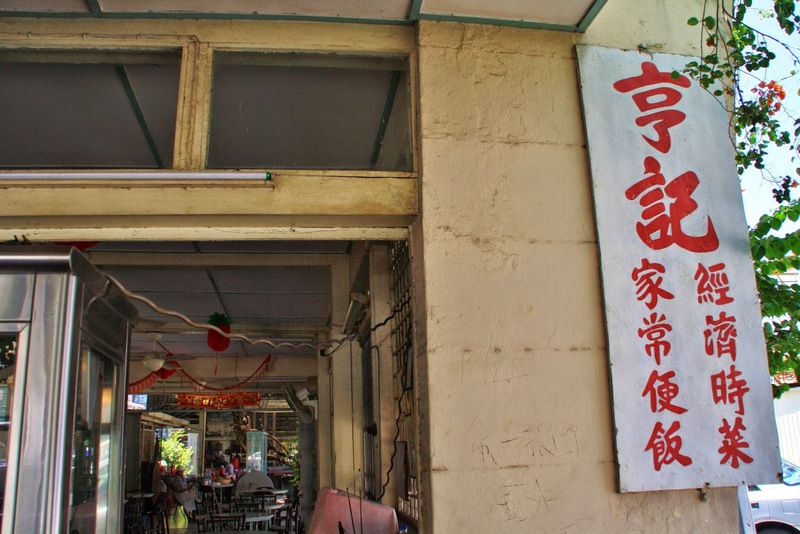 When seen in these photos, you may not believe it is located at the heart of Ipoh city. I have not been having any meal here but I guess it should be tasty as it survives till present day despite many new competitors in town. Perhaps the attraction came from what is written on its signboard, "home cook and affordable dishes". 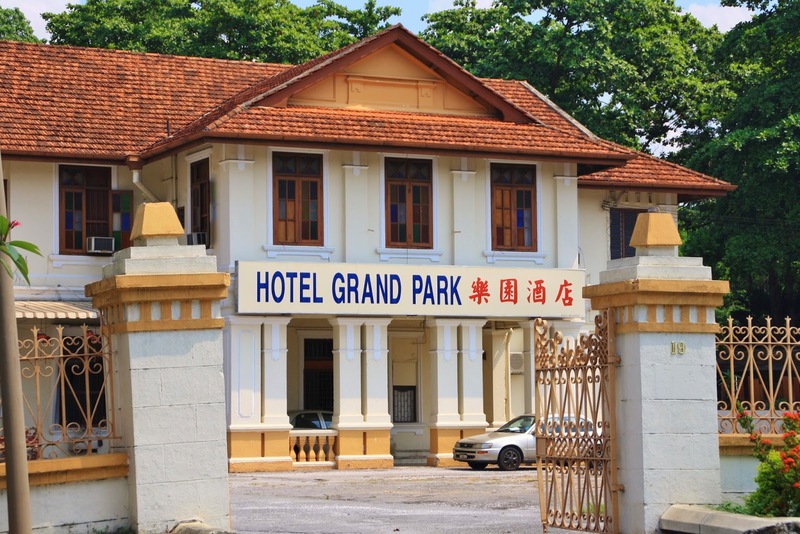 Anyone familiar with Grand Park Hotel in Ipoh? I guess this is certainly not a well known name among Ipoh people. Even after seeing these photos, probably most people may still unable to point out its exact location. 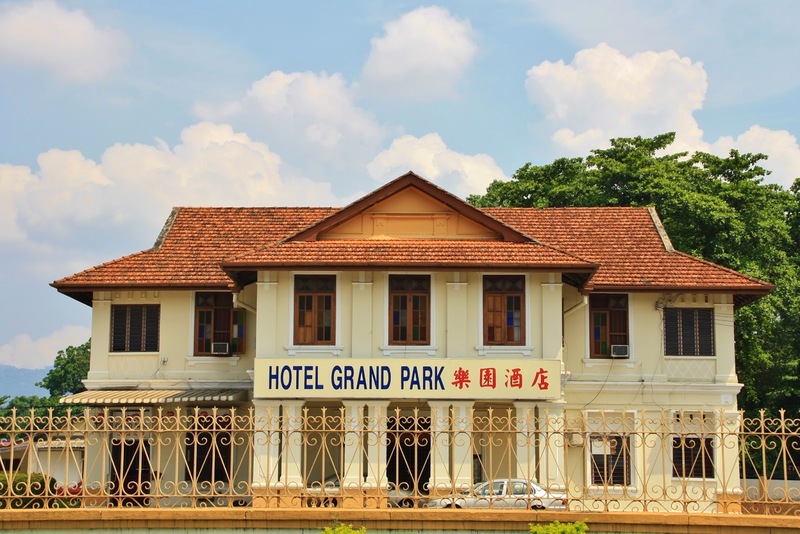 Grand Park Hotel is an old mansion at Bendahara Road, right opposite to Sri Maju Express Bus private terminal. It looked like an empty mansion but somehow I believe the hotel is still operating because I see there are cars moving in and out, although it is just very few. 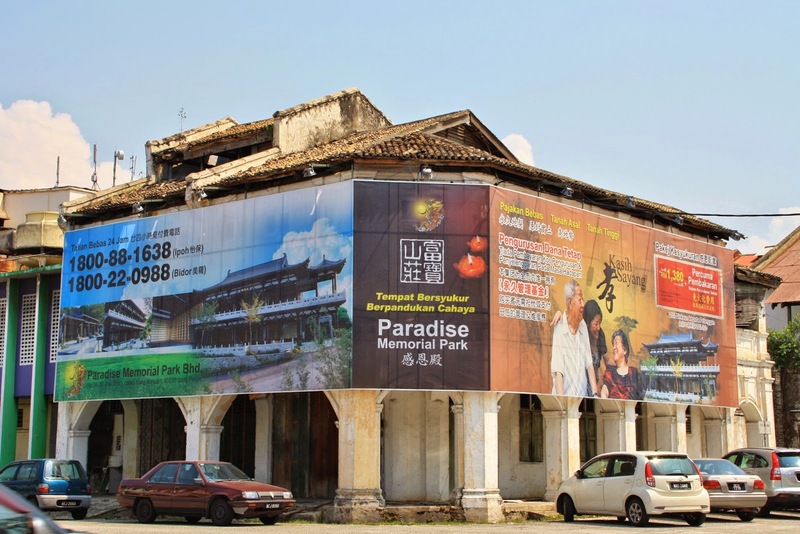 With the available land at Kampung Kuchai behind this hotel, it has indeed good potential to be re-developed as a unique heritage hotel, by benchmarking many successful cases in Penang and Malacca. Most of us do not remember these shophouses which located right behind the previous Rex cinema. During my youngster time when the cinema was still operating, one of these shophouses used to be a motorcycle parking. 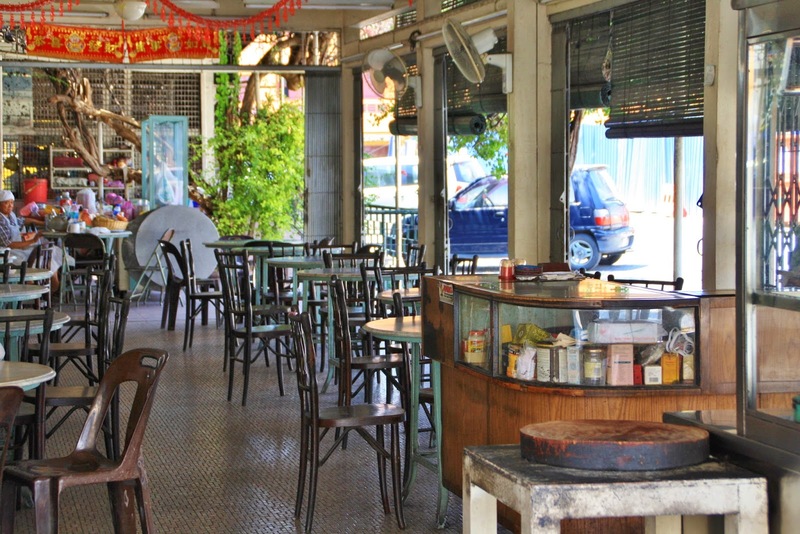 However since the closure of Rex cinema, the shophouses also lost its purpose in the middle of downtown & has been vacant for long time, as seen in an earlier post on November 2012. Looking at its poor condition, I always worry someone will demolish it for new development, just like the row of shop adjacent to it. However, despite feeling sad to see the shophouses are now only utilized as a platform for billboard, at least it will survive for some years. Hopefully one day in near future someone realize the value of this heritage building will endue it new life.